Pic.1 / Gynaecology and Obstetrics Clinic, Portugal. The grid pattern of the tiles and the tight arrangement of the chairs leads to feelings of sterility where warm humanity is missing. According to statistical research, there is in the appreciation of colours, a colour encoding operative that coincides with the functioning of the brain and the nervous system (Alpaerts, 1983). Da Pos &. Da Pos &. Green-Armytage (2007) think that people on biological grounds, subconsciously but according to certain rules, lay links between emotions and colours. At the Technical University Delft, Pieter Desmet (2002) developed a measuring instrument, with which you can examine how products arouse emotions on the basis of their physical appearance cross-culturally. Other known intercultural studies of Ekman (1992, 1994), Lane & Nadel (2000), Oberascher & Gallmetzer (2003), da Pos & Valentini (2005) confirm the observed structures. There are several reasons to choose certain picture signs, colours and symbols. There is firstly the message itself, and the specific target group. These will differ between a general hospital and a paediatric clinic. Both have the important task to reassure and to comfort the patients and to surround them with loving care. But adults put more faith in a scientific approach and will be suspicious when the design of the offered services is too informal (Mahnke, 1996), whereas children are just deterred by the sterility of a hospital and benefit more likely from a stay-at-home playground feeling. You can also choose colours functionally, for example, for each service or function within a hospital, the colours can say something about the content of the service or the function of the space. You can lay several emphases like on the one hand the scientific aspect of health care, on the other hand the loving care. Or you can emphasize the result: health, instead of focusing on the illness. 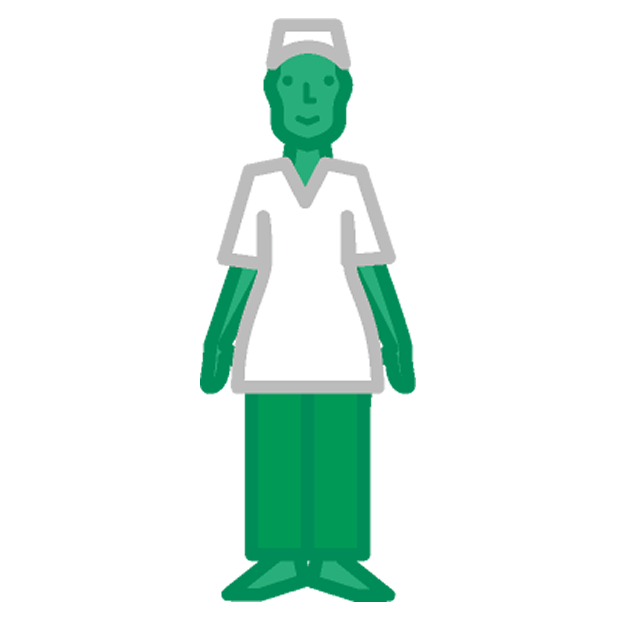 Can we determine what the core of the care is of the health institutions and services, just by looking at the most attentive colours, forms and symbols they use? We examine firstly the separate concepts of white, green and blue, and then explore the different combinations. We restrict us to the institutional expressions of hospitals, pharmaceutical companies and health insurances. There are several aspects of meaning concerning a separate colour, which we can express by the various shades. Dark blue for example, evokes a sense of balance and tradition (Lüscher, 1969); lighter blue appears suitable in architecture to create an experience of space (Meerwein e.a., 2007). I will limit myself in this text mainly to primary colours. All over the world white is the colour of choice for the medical sector. White arouses a hygienic feeling and yet it is a reassuring, comforting, soft colour that has nothing to hide (Caivano e.a., 2003). White encourages a fair, scientific approach, without false ulterior motives. The corresponding shape is the lattice or grid pattern. Tightly arranged white bathroom tiles, the epitome of cleanness, can be found in all areas where hygiene is important, laboratories, bathrooms, toilets, kitchens. Sterile gauze or cloth contains a similar, finely woven grid. Further, the grid pattern also occurs in technical-scientific surroundings on graph paper, spreadsheets, schedules, etc. 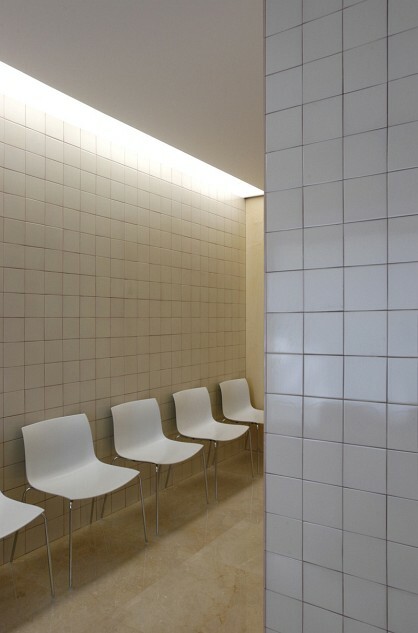 When white dominates a hospital interior and moreover comes with a tightly arranged minimalist architecture, then the patients can, like on a spreadsheet, feel themselves a number. And then the reassuring hygienic feeling can turn into a sterility from which all humanity has disappeared (Mahnke, 1996). See pic.1. Green, undoubtedly the colour of nature, stands on the one hand for life and fertility, for healing and health, but also for danger. The animal that joins these dual properties is the snake. The snake was considered in antiquity as a fertility symbol associated with the mother goddess (Biederman, 1989). The serpent rod or Aesculapius was already shown on a Sumerian vase from 2000 BD as a representation of the medicinal god Ningishita, the prototype of the later Greek god Asklepios (drblaney.com, 2011). Pic.2 / Information brochure of the Belgian province of Antwerp concerning breast and cervical cancer. Two types of femininity are portrayed here. The feminine aspect of fertility is reflected by the snake, but we see through this animal also the negative side of cancer and infertility. A softer, finer womanhood is generated with the white veil. Admittedly, the shape of the veil seems like a sterile gauze, but it suggests also tenderness that we associate with motherhood. Within the context of healthcare (medicine and pharmacology) the snake still emphasizes the positive side of the green concept: the healing power. See pic.2. The cross or plus sign can replace the snake in this sense perfectly. The plus sign stands thus for the surplus value which is produced by fertility (Liungam e.a., 2004). Greenness also reduces stress. Live plants in a hospital room promotes the healing of the patients. But Mahnke (1996) warns that plant parties on the wrong places in a hospital environment can colour the skin of the patients greener, making them appear even sicker than they are. Blue is a harder, heavier colour. On blue you can build. Blue is firmly tangible and refers to reality. Blue is an earthly, inorganic, material concept. When facing reality we stand with our both feet on the ground, we are down to earth. The earth is called the ‘blue planet’. In Christian images we see God, who is in heaven, governing in yellow surroundings over the blue earth. The ground is the cold bearer, the inorganic matter on which the green life can be established. The concept is that of raw materials such as metals, minerals, rocks, sand. See pic.3. 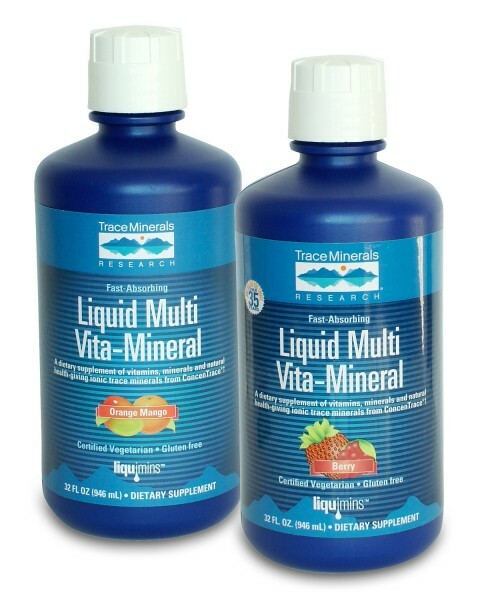 Pic.3 / Trace Minerals, packing for mineral food supplements. Physiologically, blue allows the blood pressure to decrease; it has a calming impact on the central nervous system. “The body gears to relaxation and recovery. Therefore, in sickness and exhaustion the need for this colour is greater“, writes Max Lüscher (1969). Most researchers and designers ignore the differences in meaning of colour combinations. But the emotional significance of design arises precisely because of the contrast between colours. “Specific combinations of colours are said to produce the best results in terms of appeal and meaning,” writes Demirbilek and Sener (2003). Oberascher and Gallmetzer (2003) reach the same conclusion: “(colour combinations) seem to express a meaning that has a more comprehensive and differentiated ‘semantic form’, which cannot be explained completely by the constituent single colours”. That the ‘order’ of the colours in a combination is crucial, shows when we for example compare white-on-green with green-on-white. White-on-green is the combination of gaming and gambling. It is the white playing cards or dice on the green gaming table, the white lines on the grass field. The concept is that of the destiny wheel which can turn out favourably or unfavourable. This combination stands among other things for the uncertain outcome. Green-on-white on the other hand is the combination which awakes confidence and gives a feeling of certainty. Therefore, this combination is so popular with insurance companies, brokers and banks. See pic.4. With the colour combination green-on-white the dangerous aspect of green, is eliminated by the reassuring white as a background colour. The result will arouse feelings such as safety and security. It concerns here a certain care aspect where the healing quality is added to tenderness. Together they represent a type of maternal care which can be magnified to a societal scale. Ensuring the well-being of people, providing social security and health insurance, is the foundation for a safe society. 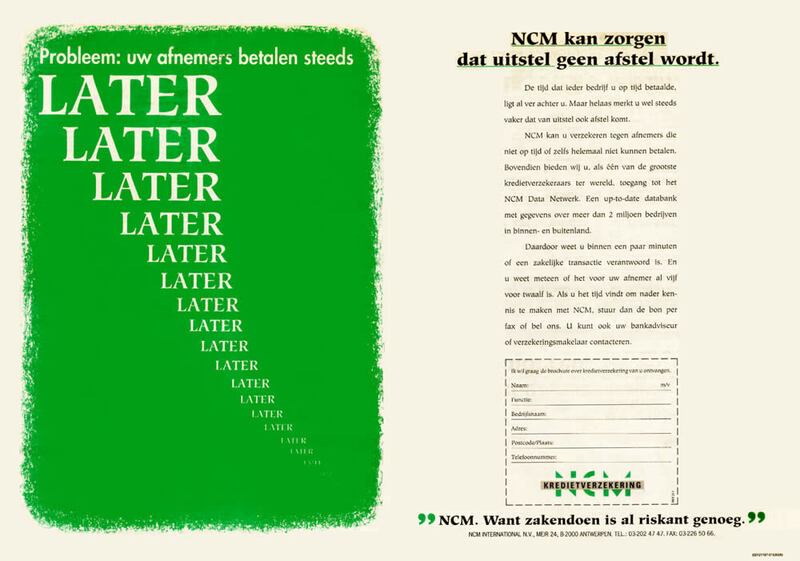 The Belgian OCMW, which provides a basic income for each citizen (theoretically), has since its establishment a green-on-white logo. Also in other countries and cultures this colour combination is used fairly common for social care and insurance. See pic.5. 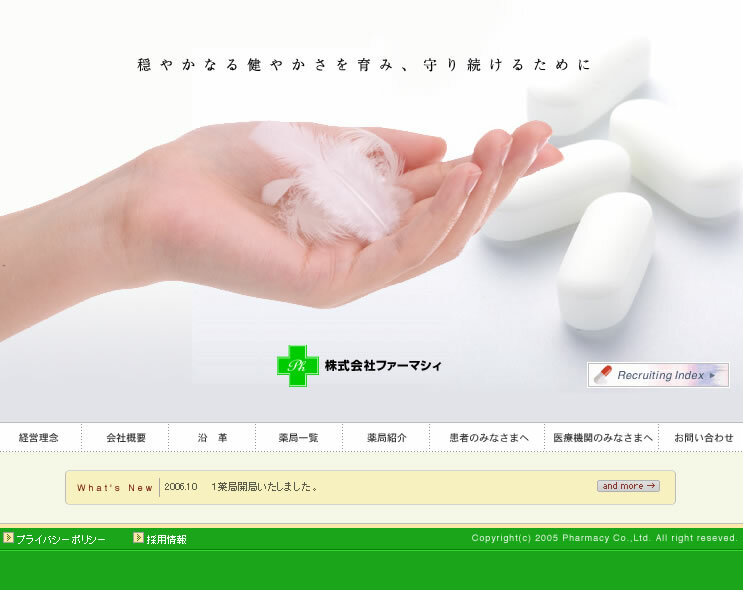 Pic.6 / Internet site of a Japanese producer of medicines. The large amount of white emphasizes the chemical. The ethereal of the chemistry is expressed with a weightless feather. A green cross and horizontal line complete the picture of pharmacology. Green-on-white is also the colour combination of apothecaries, the pharmaceutical industry and associations. The beneficial poison (green) is chemically (white) produced. See pic.6. White on a green background gives a very different feeling. Other aspects of the same colours are taken into consideration. The fluctuation of green in this order is reinforced by the floating white. White-on-green is the gamble, the risk. Within the context of care the core word here is ‘guest’, like in the archaic “guest house” (dutch; gasthuis). It does not concern the insured social care of green-on-white, but the charity between citizens. A form of love which however offers no guarantee, instead entirely depends of the goodwill of the donor. This colour combination is retrieved in all subjects that deal with the reception of guests such as in the hospitality business and the hotel sector, but also in the hospitals. Pic.7 / Hug a nurse, charity campaign for Oxfam Third World international confederation. A hospital fulfils perfectly the hotel function: it provides its guests with bedrooms. The hospitality, the warm welcoming of the ‘guests’ in a hospital is looked after by the nursing staff. See pic.7. The care task consists in giving the patients and visitors a feeling that they are loved and wanted. Mahnke (1996) recommends in his Health and Care Facilities-research, to give the reception of a hospital the look of a hotel entrance hall, because in the initial contact, a feeling of cordiality, human warmth and the promise of care is important. 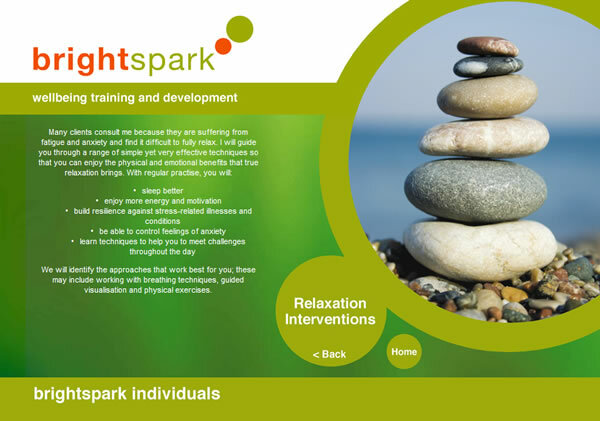 Pic.8 / The internet site of Brightspark Relaxation. A symbol for hospitality is a flower bouquet or floral wreath. In the hospitality industry a bunch of flowers at the reception or on tables will greet people warmly. In Asian countries someone is hailed by hanging a garland around its neck. In India flower patterns are drawn on the pavement outside the front door to welcome visitors. Also, bouquets exercise a beneficial effect on patients. In hospitals, flower motifs are preferred in places where patients should relax such as in waiting areas or in operating rooms. White-on-green has indeed a strongly relaxing effect. You thus frequently see this colour combination in the world of wellness and body care: whirlpools, relaxation massage etc. See pic.8. Pic.9 / The internet site of General Medical Practitioners Poortvliet, Holland. Which associations arise with the colour combination white-on-blue? Whereas white is already a hygienic, sterile colour, with blue underneath this feeling is strengthened. Detergents which want to communicate an extreme cleanliness, have this colour combination. Whereas white calls a scientificality, in the combination with blue an even sharper, more precise, more perfectionist feeling will arise. The contrast between the ethereal white and the earthly blue creates a sense of altitude. With white-on-blue we stand no longer on the ground but we float somewhere between the white clouds in the blue sky. See pic.9. Pic.10 / John of God, a miracle doctor from Brazil with its own hospital, places himself high in the sky between white clouds. White-on-blue is the favourite combination of doctors and specialists. In the context of their high social and professional position, they become almost divine healers with this colour combination. The effect becomes implausible when sparkling rays and auras are depicted. Than the doctor becomes a miraculous healer. See pic.10. In visual communication the conscious approach through colour semantics is increasing. This communication will be better understood and remembered because it refers to unconscious meaning. In the healthcare sector, where combinations of white, green and blue are the dominant colours, we see needs and expectations changing. In addition to the healing of patients, there is an increasing attention to well-being and comfort. When the message changes, the picture language and the use of colour will change accordingly. This article was first published in Tekstblad, Dutch Magazine on Text and Communication, Radboud University NL. Vol.17: 03-2011. Alpaerts, F. Genetische Semantiek 1 & 2. Antwerpen, Genetic Coding, 1983. Biederman Hans Prof. Dr. Knaurs Lexicon der Symbole, Droemer Knaur, München 1989. Caivano and Lopez. National Council for Research, Buenos Aires University, Argentina. The Retoric of Black, White and Red: Reasonability and aesthetics to persuade with color. Proceedings of AIC 2003 Bangkok: Color Communication and Management. Da Pos, O. Green-Armytage P. Colours and basic emotions. Dipartemento di Psicologia Generale Università di Padova, Curtin University of Technology, Perth, Australia. 2007. Da Pos, O., Valentini, S.. Colouring the Emotions. In: AIC Colour 05, Proceedingsof the 10th AIC Congress, Sociedad Española de Optica, Granada, 263-266, 2005. Demirbilek O., Sener B. Product design, semantics and emotional response. 2003 article in Ergonomics, vol 46 nos. 13/14, pp.1346-1360. Desmet, P. Designing Emotions. Proefschrift, Technische Universiteit Delft, 2002.
http://www.drblayney.com/Asclepius.html The probable medical origin of the single serpent around a rod. Ekman, P., Davidson, R-J. (Ed. ): The nature of Emotion. Fundamental Questions. New York: Oxford University Press, 1994. Ekman, P. An Argument for basic emotions. Cognition and Emotion, 6, 169-200, 1992. Lane, R.D., Nadel, L. (Eds.) Cognitive Neuroscience of Emotion. New York: Oxford University Press, 2000. Mahnke,, F.H. Color, Environment and Human Response. New York, John Wiley & Sons, Inc. 1996. Meerwein, Rodeck, Mahnke. Color – Communication in Architectural Space. Basel, Birkhäuser Verlag AG, 2007. Oberascher L. and Gallmetzer M.. Colour and Emotion. Psychology of Architecture and Design, Austria. Proceedings of AIC 2003 Bangkok: Color Communication Management, 370-374.